Patrick Wilson was doing what he loved on Feb. 10, but this time there were devastating consequences. He was attending an event, as an instructor, hosted by Porsche Club of America and held at Roebling Road Raceway, near Savannah, Ga. He was instructing an experienced driver on a closed course when, it has been speculated, the driver had a medical emergency. Patrick managed to grab the wheel and steer it away from other vehicles, but the car he was in ran off the course, traveled 300 feet then hit a berm and flipped going more than 100 mph. Patrick was severely injured and has been in a hospital ever since the accident. He has a broken left arm, broken right ring finger, broken sternum, six broken ribs, broken nose, broken eye socket, broken pelvis (in three places) and broken bones in his neck and back. His recovery will be long, painful and costly. Patrick and his wife, Valerie, have great insurance, but the out-of-pocket medical bills are already mounting. Patrick had to be airlifted by helicopter from the race track to the hospital, and he will need an ambulance transport from Savannah to an Orlando rehabilitation center when he's released. While Patrick is in Savannah, his wife and extended family members are incurring expenses related to gas, food and lodging, as well. Patrick must wear a neck brace for a minimum of 12 weeks and a back brace for a still-undetermined length of time. 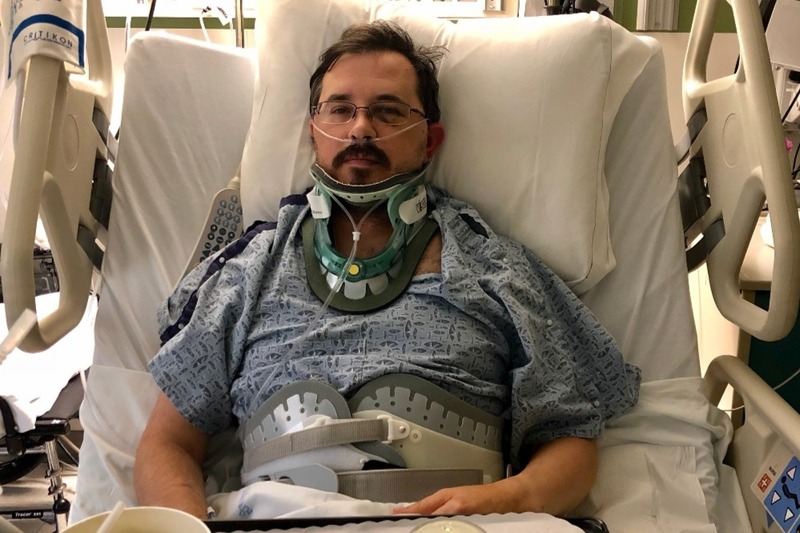 He isn't allowed to put any weight on the left side of his body, and he will have to spend at least three weeks in a rehab center while he gains his strength, mobility and independence. Even after he is home he will continue with his physical therapy. It is unknown how long Patrick will be out of work, so please consider making a donation to help Patrick and Valerie with their ongoing medical expenses. They are asking for continued prayers, as well. Be sure to follow Patrick's story. They have promised to provide regular updates and photos of his progress on this GoFundMe page. Patrick has completed rehab and is now home! He has another 10 weeks in the neck and back brace and will continue with physical and occupational therapy three times a week. He’s on his feet, walking with a walker. New scans showed that his pelvis is not fractured. Praise God! Thank you once again for your prayers, well wishes, and donations to his GoFundMe campaign! He is feeling the love and support! Patrick is resting comfortably at rehab in Orlando! Today is a day for evaluations and getting settled. He's in isolation since he's been at a different hospital, I'm told that's standard procedure. He will have one hour of therapy, 3 times a day. Thank you all for your support through this journey! From Patrick and Valerie-We are so thankful and appreciative for all of the donations and shares! The response has been overwhelming! Thank you! Patrick continues to improve. He has been taken off of oxygen and is stable. Physical therapy continues to work with him on transferring to a chair. This is all he can do now until his broken arm heals and he can put weight on it as he can't put any weight on his left leg. Trauma docs want to see him head to rehab today or tomorrow. Once transport and arrangements at facility are approved, we are out of here! More info to come as we progress!